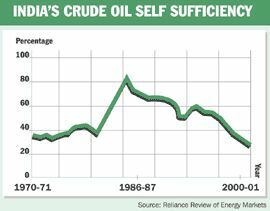 India is one of the most energy demanding economy; but is it secure? High petroleum prices are forcing the world to look for alternatives to crude oil. Amongst the various options being touted to deal with high crude oil prices, biofuels like ethanol and biodiesel are probably the most popular. However, a closer look reveals that ethanol may not be a very viable alternative to petroleum in the near term, at least in India. The major problems are the large requirement of agricultural land and irrigation water and the cost. Proponents of ethanol in India point to the large-scale ethanol blending programme in Brazil. However, there are some major differences between the two countries that could make ethanol a costly proposition in India. Brazil has an abundance of land and water resources compared to India. The area under sugarcane cultivation in Brazil is almost six million hectares, against four million hectares in India. A large chunk of the Brazilian cane production is used for ethanol manufacture. Almost the entire sugarcane production in India is used for producing sugar, while ethanol is produced from molasses - a byproduct. This places a limit on the total quantity of ethanol that can be manufactured in India - annual production ranges from 1-1.2 million kilolitres. In absolute terms, this is much less than India's petroleum consumption of about 110 million tonne per annum. Clearly, ethanol can have only a limited impact on India's energy security. Another issue is the competing uses of ethanol by the liquor and chemical industries. In case of chemical industry, ethanol is used as a raw material for manufacturing products that are much more valuable than fuel, including chemicals like ethyl acetate and ethylene glycol that are far more valuable. "Value-added products manufactured by the chemical industry that use ethanol as the feedstock range in value from $650-3,000/t whereas if ethanol is used as fuel, its value is just $500/t," according to an official of Indian Chemical Manufacturers Association. India can increase ethanol production in three ways. Firstly, by producing ethanol as the main product from sugarcane - as is done in Brazil. This will require reduction of the sugar output, which is difficult. Second option is to bring additional land under cultivation - which is also not possible in India given the scarcity of agricultural land. Food crops like wheat and rice compete with sugarcane for prime agricultural land in India - increasing the area under sugarcane may mean cutting down on food production. Also, given the cost structure in India, ethanol produced this way is more expensive than petrol. According to industry sources, the same amount of cane juice can be used for 2 kg of sugar or 1 kg of ethanol. The third option, which is possibly more feasible, would be to produce ethanol from crops like sweet sorghum etc., which can be produced in semi-arid areas. Other biofuels like biodiesel also grow in such areas. The long term solution, on which research is going on globally, is to convert cellulose into ethanol. This will allow plant wastes to be converted into vehicle fuel. That, however, is still in the future. Despite the rising price of oil, the world's demand for petroleum continues to grow. Global demand for petroleum was 78.7 million barrels/day in 2003, which increased to 82.5 million bpd in 2005 and it continues to grow. Bringing new supply to keep the oil market in check is critical and one of the most important pieces in this jigsaw could be in Canada. The world's second largest nation also has the world's second largest reserves of oil, pegged at 179 billion barrels whereas the production is just 3.05 million barrels/day. In contrast, Kuwait, which has reserves of 99 billion barrels, produces 2.5 million barrels/day of petroleum. Clearly, there is a great potential for an increase in production. An additional two million bpd is expected from Canada over the next decade. The problem with Canadian oil, however, is that it is not the regular black liquid that gushes from the ground but is in the form of oil sands. Almost all of these reserves are located in the state of Alberta. Oil sands are a mixture of clay and bitumen (15%). Processing oil sands to get petroleum products is an expensive process. Unlike crude oil which flows, oil sands have to be mined. The bitumen has to be separated and finally, bitumen needs to be processed to yield crude oil. This crude oil can then be processed by a conventional petroleum refinery to yield products like petrol and diesel. There are two methods of extracting bitumen from oil sands. In the mining approach, oil sands are dug out like any other ore or mineral using truck and shovel methods. Bitumen is separated from the sand by warm water. However, the mining approach is feasible only for reserves close to the surface. For deeper reserves, the in-situ method is relied on, which separates the bitumen from the sand underground. Hot steam is injected into the oil sands via wells; this liquefies the bitumen which is subsequently pumped out. As per the last available figures, about 6,00,000 barrels/day of bitumen was extracted via mining methods while 3,80,000 bpd was extracted using in-situ methods. It takes about 1.16 barrels of bitumen to yield 1 barrel of crude oil. As a result, petroleum production from oil sands is viable only if crude oil prices are high. According to a recent report brought out by the National Energy Board of Canada, production from oil sands is viable if the price of benchmark crude oil WTI averages around $35/barrel. The price of WTI had averaged $31/b in 2003 and has been going up consistently every since. It increased to $41/b in 2004 and $56/b in 2005. For the first six months of 2006, the average price has been $67/b while the current price is over $70/b. In the present scenario, a sharp fall in crude oil prices seems unlikely. CNOOC have already taken up stakes in some oil-sand projects. The most obvious risk for unconventional oil projects is a drop in crude oil prices which can ruin the financial viability of these projects. While crude oil prices are not expected to ease for at least a few years, it needs to be remembered that these projects have lives of decades. Another risk for the oil sands is the rising cost of extraction. Cost of mining equipment and labour has gone up in the past few years pushing up. These projects also require a lot of natural gas for energy inputs, so price of natural gas can also impact returns.